State violence seems endemic in the west, given legitimacy by the language of those in power and emboldened by a shrill off-the-leash media desperate for clicks and readers in a bear-pit – a downward spiral of circulations and viewers. It starts at the very top and trickles down to the cop, the security guard, the fascist, the bouncer. The much-maligned Panorma have today exposed the vicious practice of G4S staff creating “chaos, incompetence and abuse” at Brook House immigration removal centre. The programme claims to have undercover footage showing officers “mocking, abusing and even assaulting detainees” at the facility, where drugs are allegedly rife. G4S said nine staff had been suspended pending further investigation in the latest scandal to hit the firm. This is state violence out-sourced, one-removed from accountability. All of this is quietly condoned. Of course this could be seen as an issue of just more exposure of a violence that’s always been with us. None of this is based on ‘data.’ This is not scientific. But there’s a madness in the air, or is that just me? Not just you, Mike. Creeping fascism is beginning to trot. It will be galloping before long – unless we do something about it. Independence will be a start -at least for us in Scotland. Yes indeed. The government and it’s corporate cronies are the mafia. And when needed, violence is utilised to the full as our humanitarian interventions around the world shows. 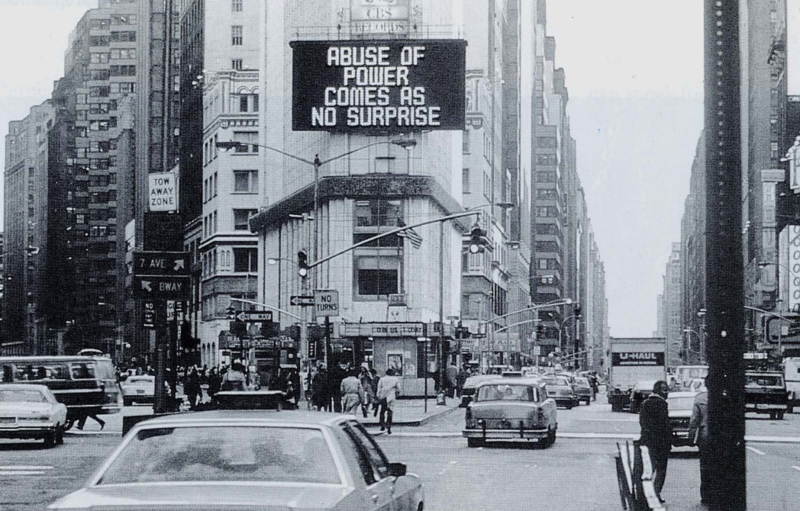 Jenny Holzer – Truisms is the artwork that should be credited.